GAIA - From Ancient Hellenic Γαῖα, a poetical form of Gē Γῆ, "land" or "earth"; also Gaea, or Ge was the goddess or personification of Earth in ancient Hellenic religion, one of the primordial deities. Gaia was the great mother of all: the primal Hellenic Mother Goddess; creator and giver of birth to the Earth and all the Universe; the heavenly gods, the Titans and the Giants were born from her union with Uranus (the sky), while the sea-gods were born from her union with Pontus (the sea). "She lay with Heaven and bore deep-swirling Oceanus, Coeus and Crius and Hyperion and Iapetus, Theia and Rhea, Themis and Mnemosyne and gold-crowned Phoebe and lovely Tethys. 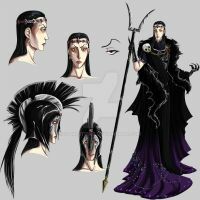 After them was born Cronos the wily, youngest and most terrible of her children, and he hated his lusty sire." TIME CONSUMED - 7 hours on and off. Mistakes, as usual, were made on purpose. Η Μητέρα Γη στα καλύτερά της. Συγχαρητήρια! Ήταν πάντα η αγαπημένη μου. Beautiful contrast of colors for a spectacular piece of art. Wow no wonder they call her "Mother Earth" . I like the depiction of the manifestation process here. Yay, it's another piece made by you. This is beautiful. Who are you planning on doing next? beautiful. the detail and color is so amazing. Love the expressions of the fleeing people. Guess they made the mistake of building their town on top of a sleeping goddess. And before him... Nous. Or Skepsi. "Mind" - "thought"
I think Gaia would be flattered if she sees this - Beautiful! This is amazing ! I LOVE the coloring and everything ! Incredible work !